Identification: Upperside of forewing is red-orange at the base with wide black margins and 5-7 white spots near apex. 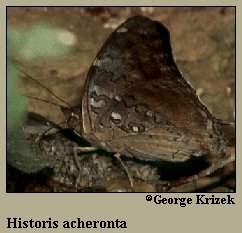 Hindwing has a short sharp tail; upper surface is dull brown. Life History: Adults are swift, strong fliers and rest on tree trunks head downward with their wings held closed. Males perch on trees to wait for females. Eggs are laid singly on terminal leaves of the host. Flight: Many flights throughout the year in the tropics; strayed to south Florida in June. Caterpillar Hosts: Tree and shrub Cecropia in the fig family (Moraceae). Range: Brazil north through Mexico; Greater Antilles. A rare stray to southern Florida.